It’s a great time for home-theater technology. Screens are growing bigger and better, sound is getting clearer, and content is becoming more accessible. Wireless options are making it possible to set up an amazing home theater without major construction, which is great for renters and anyone who doesn’t want the hassle of running cables behind the walls. And with the rising costs of cable and satellite services, many consumers are cutting the cord and switching to lower-cost streaming services. With the high-quality, on-demand content available through services like Netflix, Hulu, and HBO Go, it makes sense to upgrade your home theater equipment and improve your overall home theatre experience. 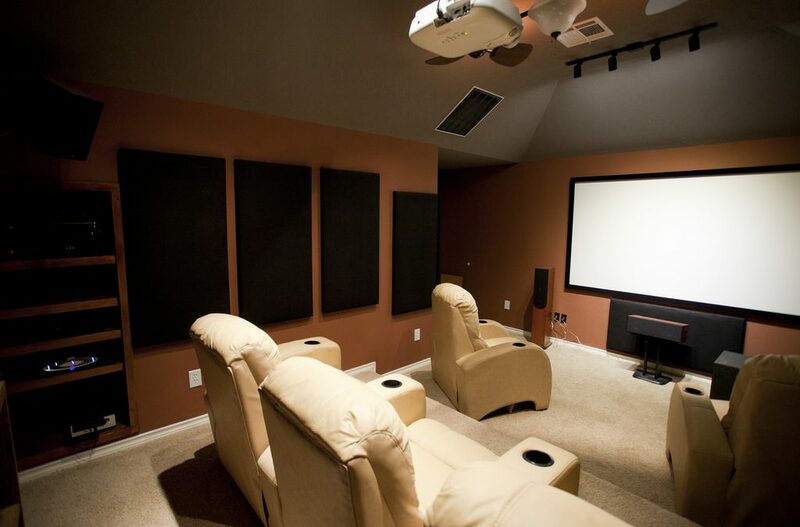 There are tons of options for bringing the best home theater experience to your home. If you’re starting a new home theater from scratch or updating your old equipment, here are five things to consider along the way. “Cut the cord on cable.” The sentiment is growing more and more popular, with people leaving their satellite and cable TV providers in droves. What you may not realize is there are cords to cut inside your home, too. Whether or not you choose to ditch your TV service, going wireless with your display and your sound system is easy. Plus, cord cutting can save your sanity and give your entertainment zone a cleaner look. We’ll let you in on a secret: You don’t need a wireless network to go cordless in your home theater. A strong contender for today’s best screen-mirroring device is Actiontec’s MyWirelessTV3, which plugs into any HDMI-capable device. You can wirelessly connect your screen to almost anything that has an HDMI output (gaming consoles, laptops, even cable boxes that are set up in other rooms). It also lets you use your device’s remote control—even if the device is far from the screen. MyWirelessTV3 is ideal to use for your home theater experience because of its high-quality connection. You can wirelessly broadcast HD or 4K images to your HD- or 4K-capable display, and it supports displays up to 150 feet away, even through walls and floors. It allows you to connect to your TV without cords or set up a whole wireless projection system. It also makes your display much more portable. Since it doesn’t have to be near a router, you can move your TV or monitor anywhere without having to mess with cables. A wireless screen connection is just the beginning. Images aren’t the only way to go wireless, and sound is just as important as picture. Wireless speakers are available (but keep in mind they’ll still need to be connected to a power source.) MyWirelessTV3 comes in handy here, too; it can handle 5.1 surround audio pass-through. Setting up an optimal home theater display can mean lots of experimenting, but it’s not all guesswork. Here are some measurements that will help you figure out the best setup for you. Screen size. Shopping for a new high-definition TV is both fun and daunting. If you’re in the market for a new screen, you may be tempted by the enormous displays on the market. But bigger isn’t necessarily better. The right screen depends on the room it will be in and where you plan to sit while viewing. The first thing you’ll want to do is measure the distance from your seat to where the screen will be. One school of thought says to take that distance in inches and divide it by 1 to 2. The result is the approximate size in inches of your ideal screen. Also consider the aesthetics of the room and your personal preferences. For a 4K TV at a six-foot viewing distance, consider a 72-inch screen. For a four-foot distance, you may want a 48-inch TV. If you’re working with an existing screen, positioning is everything. Read on to find out how to optimize your screen when you can’t control its size. Angle. The standard expert advice is to set up a viewing angle of 30 to 40 degrees. With the viewer as the vertex, the display will reach across that 30- to 40-degree viewing area. Distance. The best distance for viewing is generally 1.5 to 2.5 times the diagonal measurement of the display. Knowing your optimal viewing distance will help you decide what size screen would be best. If you’re working with an existing screen, knowing its diagonal width can help you decide where to place your seating. Height. Ideally, your eyes will align with the center of the screen. If you want to place the screen higher (many people do), consider angling the screen down toward you. Angle, distance, height, and screen size are all parts of the same equation. That means you can make adjustments to any or all of them, balancing everything so it works perfectly for your space and your tastes. Resolution. You have a few options when it comes to screen resolution. Remember that more pixels mean higher resolution (and better picture quality). HD screens are dropping in price as 4K (sometimes called “Ultra-HD” or “2160p”) become more widely available. That’s because of the difference in quality. 4K resolution is 3840 x 2160 pixels, and 1080p resolution is 1920 x 1080 pixels. It’s a big gap. In choosing a resolution, the major considerations are price and content. 4K TVs are more expensive, and 4K content is still somewhat limited. The major streaming services do offer some content in 4K, which will work well if you have an internet connection that can handle the load. Many movie titles are available on 4K Blu-ray discs as well. The availability of 4K content will continue to grow. A final note on resolution: If you’re shopping for a 4K television, see if you can view some 1080p content on it before buying. The best 4K TVs have excellent scaling, which will keep 1080p content from looking bad on the 4K screen. Some lower-end 4K displays don’t do so well with lower-resolution content. One of the best parts about the home theater is that you can get as comfortable as you like. Choosing the right seating is critical in setting up your space. There’s a lot to explore when it comes to seating. Recliners are very popular (for a good reason). So are seats with movable armrests, which allow you to have your own space or share with a loved one. If you’re setting up a dedicated home theater (as opposed to a space that doubles as a living area), you might want to explore the luxury theater-style seats that are available. If you’re adding a home theater setup to your living room, you can use your current furniture or upgrade to more comfortable seating that complements your new arrangement. There’s an element of excitement to watching a movie with the lights out, but turning the lights down isn’t just about ambiance. If there’s a glare on your screen, you’re not getting the whole picture. If you want to recreate true theater lighting (or better), you’ll need to be able to block out any outside light sources. That may mean installing blackout curtains. You can also consider lighting when installing your screen, placing the screen in a position that avoids glare. From eliminating the cords to dimming the lights, there are many steps you can take to create the ideal home theater experience. Expert advice, your preferences, and a little experimentation can all help you build a home theater that’s perfect for you. Enjoy the show.